We're enjoying the last of summer, but for us here in Colorado at very high altitudes, it sometimes seems like it's summer all year round. How do I protect my kids from the sun's harmful rays? Together with La Roche-Posay, I will be sharing some tips with you. We are truly enjoying the last days of summer. Summer for us in our family usually means, road trips, staycations and the water parks and pools. We love to try and stay as cool as possible. When we're not on the road, you can find us indoors under the air conditioning. It can get hot here in Colorado, but for us being at this high of an altitude, it can sometimes feel as though we're almost on "Planet Sun". When I mention that I'm not a fan of summer and it's heat, most people would ask "aren't you accustomed to the sun since you're originally from the Caribbean? ", and I would say, "There is a difference between summers in the Caribbean and summers in North America". In the Caribbean you're on an island surrounded by the ocean and a tropical breeze. While it can get hot at times, it's very much bearable. Another reason I hate the summer sun is the fact that I do burn. Believe it or not African-American's do burn too! It's also one of the reasons that I keep a sunscreen in my bag for not just me, but for my children as well, especially my youngest. It's better to start their sunscreen protection NOW, rather than later. So what tips can I share to protect your kids from the sun's rays? 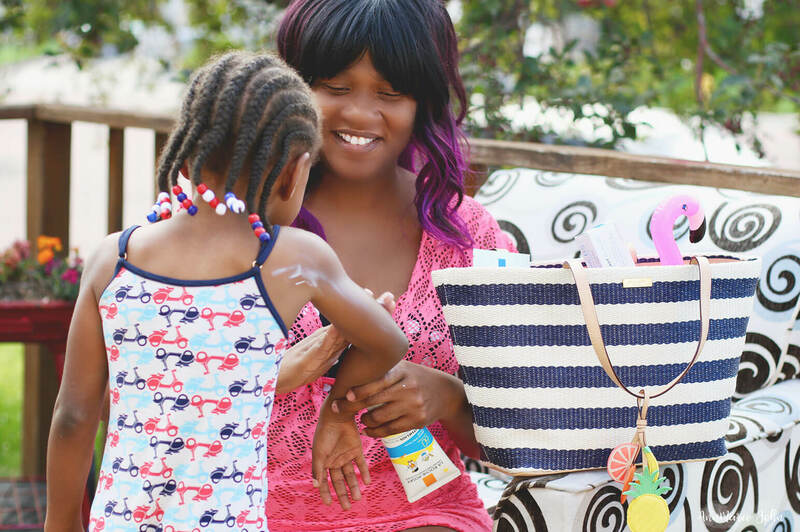 Whenever we go outdoors, before we hit up the water park or anywhere, be it summer, winter (yes you should be protected even in the winter), we always lather up on our sunscreen. I love looking for products that are high-quality, products that I can depend on, and have a proven track record. I sometimes get recommendations from friends and family, and sometimes it's just trial and error. One sunscreen that I've grown to love is La Roche-Posay Anthelios Dermo-Kids. This is a sunscreen that was developed with moms, dermatologists, and pediatricians, and is specifically made with powerful UVA/UVB filters that provide broad spectrum, 80-minute water resistant protection, highly protective ingredients and antioxidants that are effective, safe, and gentle on children’s sensitive skin. When it comes to my child, I want products that are not only gentle but effective and this does both jobs! There's a reason they're called sunhat's. It's because they protect your head from the sun. While baseball caps are cute, "Go Yankees! ", they don't really protect your little one's neck and ears as they should. For hats, I would say the bigger the better since the more protection, the better. If you do decide to wear a baseball cap, be sure to protect any skin that's exposed with sunscreen. It's not just your body that needs protection, but so does your eyes. You may remember we just had an eclipse and were told not to look at the eclipse directly because it can damage your eyes. Unfortunately, that's not the only time that the sun's rays can damage your eyes. For children, wrap around sunglasses work the best since they block almost 100% of both UVA and UVB rays. Whenever possible, wear long sleeves and long pants since they offer the most protection, compared to shorter styles. Dark colors also offer a lot more protection than lighter clothing, however in the summer, we tend to stay away from dark colors. So what do you do in such a case? That's where my next step comes in. Try and plan your activities for later in the day when the sun's rays is not at it's strongest. While you may be tempted to go out around midday, it's also when the sun's rays are strongest and most harmful. If you do decide to go to the pool, waterpark or even a day trip to the zoo, lather up with sunscreen and walk with an umbrella. Trust me, umbrella's are still cool! If you just can't help but be in the sun, the La Roche-Posay My UV Patch may be just what you need. It allows you to measure your UV exposure and the risk in real time via an app (available both on iOS and Android). This rings true for the sun. While it's beneficial because it's a good source of Vitamin D, too much of it can actually hurt. Think sunburn. They're not only painful, but too much sun can also lead to skin cancer. Did you know suffering with one or more blistering sunburns in childhood or adolescence more than doubles your chances of developing melanoma? However, be sure to have on hand La Roche-Posay Cicaplast Baume B5 to help soothe their irritated skin. It's also a good moisturizer so always keep it in your bag. That's where I keep mine, because it's also great for adults too. It doesn't leave you greasy and has a rather pleasant smell. 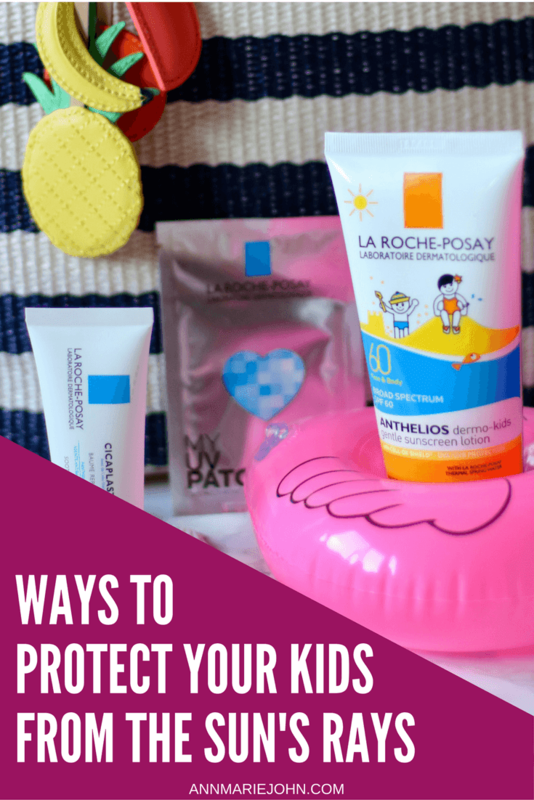 So have an enjoyable rest of the summer, be smart and protect your children from the sun's harmful rays with La Roche-Posay. You can find La Roche-Posay products at your local CVS, Amazon, or by using the store locator. Protecting skin from the sun is so important, especially for the kids. One sunburn can up their chances of skin cancer later in life astronomically. I have to agree with you, that the summers in the Caribbean and summers in North America feel different. I too hate the summer, but wear that sunscreen all the time. Better stay safe then to have problems later. I put sun screen on my kids every time we go out. Living in Florida, it is almost impossible to not get some kind of sun exposure so better safe than sorry! I grew up in the desert where the sun gets you quick, but now I live in the woods so I get slack sometimes with all the shade trees. I need to be better about sunscreen for everyone! I can't say enough about wearing protective clothing when you are out in the sun. Yes, you may look like you don't belong, but it is better to be safe when it comes to sun protection. I know you are protecting yourself and ypur kids from the sun and that is so smart. I think me and my kids who are fareskinned are at an even higher risk so I will look for this sunscreen. These are all great tips and it's so important to be protected from the sun. I love that this is made especially for kids by moms! Thanks for your post on La Roche-Posay Cicaplast Baume B5. I have been looking for awhile now on a good sunblock for kids and teens. I used to rely on the Honest Company product, but theirs received a lot of bad reviews. Definitely will try this out. Living in Florida, we are in the sun year round. Our pool/beach time lasts from March through September, and sometimes even October. 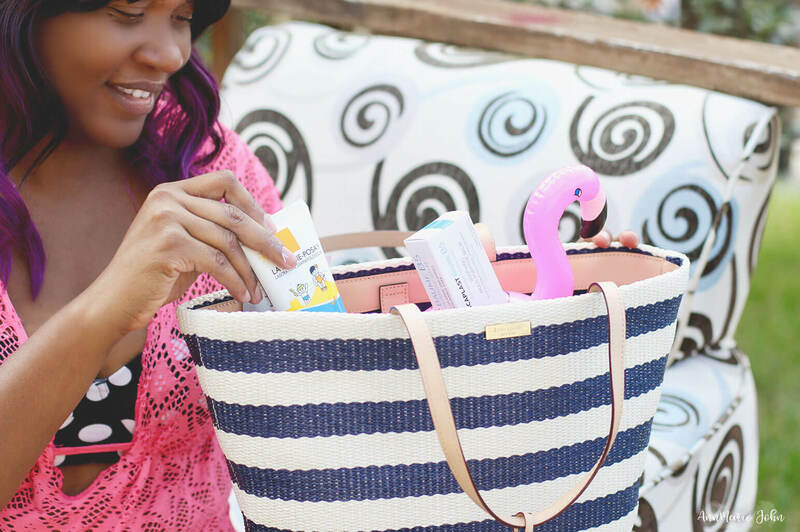 We recently discovered this sun screen and love it! These are very important strategies! Sun damage can really creep up on you so it's good to prepare every time you go out. I wear sunscreen on my face almost all year long. Better safe than sorry. Another point. When I was growing up, my dad started losing his hair, leaving his scalp exposed. But he didn't wear a hat. He ended up getting skin cancer. So it's always good for men to remember than one. This is so true, you gotta protect your kids form the sun. Here in California sunscreen is an always thing, year round for us. Love this post, great reminder! I am a beach lover myself and I always make sure that I put sunscreen all the time, I also have it in my bag. It's really important that we protect our skin from the sun. Love your tips! This beand is awesome! Great advice! The sun can be so damaging and it is so important to protect their skin from harmful rays! It is so important to stay protected from the sun. These are all important tips to keep in mind when you're outdoors! My daughter has the fairest Irish skin, so we have to always be vigilant about keeping it protected when we are out in the sun. Sunscreen and hats are two of our favorite ways to keep her skin safe. I always remind my kids to put on sunscreen when going out to attend baseball practice or any other activity that requires them to be out in the sun. I just have to be careful though to choose the right sunscreen - no harmful ingredients, cruelty free and long lasting. We use sunscreen, sun hats and sunglasses for our little ones when playing outdoors. This is a great list to keep our kiddos safe when playing outside during the summer days! I don't have kids but I do travel a lot with my husband and we love seeing the beach. It's really important for me to have a product that I can trust! This sounds awesome and I also appreciate the tips! They're all applicable for adults too. My kids can get a sunburn just thinking about being outside! I had not heard of this product line, but it sounds great to keep the kids safe in the sun. I am glad you are posting this now, because a lot of folks think that since summer is over, you don't need the protection any more. Not true! We are in Florida so sunscreen is kind of a MUST! Even in the winter - you have to have it on! I swear by this product as well, I wrote about it and I think it's just a must have! I am also used to the warm weather but I love the cold weather more. I think these tips are spot on! We try to find fun ways to make it easier for mama to protect them from the sun. :P There are often fits thrown. This brand sounds perfect for kiddos! La Roche is one of my all time favorite sunscreens. It's perfect for my delicate, sensitive skin. I always wear a hat, sunglass, and coverup when I'm out on the beach because I don't want to worry about getting burnt. Yes I do agree with these suggestions. It's really important to take good care of our skin by using sunscreen. These are very helpful tips! We use La Roche here at home as well, and I must say that it is definitely my GO TO! It's not only for the kids, but really the entire family uses it because a few burned skins taught us a valuable lesson. We're so bad about slathering up in the cooler weather. I know we should though so I got a stick of sunscreen to put in my purse. Hopefully that will get me in the habit of skin protection year-round. I am always looking for the best way to protect us from the sun! I am going to pick this up on amazon! I have such a hard time finding sun block for my kids. My oldest has eczema and everything sets it off. I would love to try this one and see if it works! These are all great tips! Sunscreen is an essential for my family everywhere we go. This is amazing cream for protecting my and mine family members skin. This is amazing cream for protecting my and mine family members skin. There is also a lot of other cream for anti-aging, which are very useful. We try to do things more before 10am and after 3pm unless it is a hike in the woods which isn't really a sun issue. These are great tips! The little flamingo float is the cutest! We have a large flamingo float for our backyard pool so I'm sure my daughters would be obsessed with that smaller version. Sun care is so important and teaching a good routine is critical for children. We live in Arizona where we really shouldn't ever be outside without sunscreen. I'm slightly familiar with La Roche-Posay, and I like what I know! It's funny how much I complain about our lack of sun here in New England, but to an extent, it's probably safer for us? We start craving Vitamin D! That said, this summer has been glorious and we've been careful! The heat is one of the things that I hate about the summertime! That is why I'm looking forward to the autumnal season. 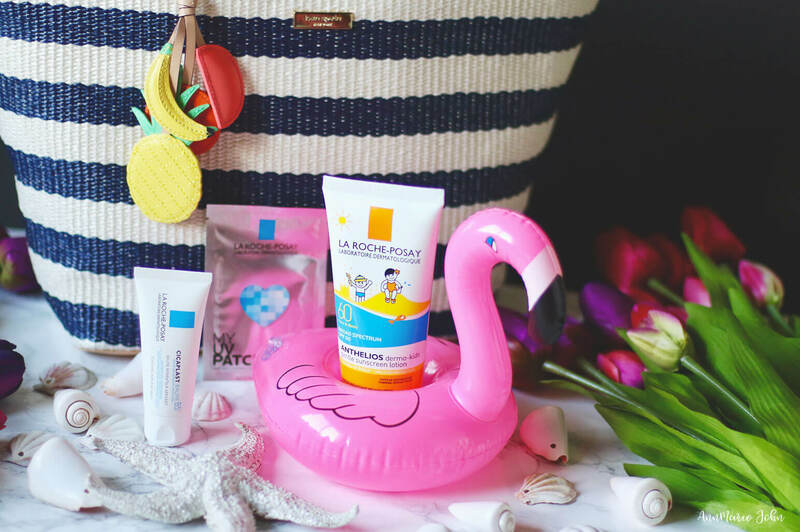 I have never used La Roche-Posay's sunscreen before, but I definitely want to give it a try sometime. Too much of a good thing is definitely bad. When it comes to the issue of sun exposure, some parents may treat it with a "damned if you do, damned if you don't" state of mind. But really, sun protection is a must at all times whether it's summer, spring or winter. Having sunburn is not really the threat, it's the possibility that your child may develop skin cancer later in life. It's really better to play safe now that be sorry later on.